Gilder Lehrman Collection #: GLC05340 Author/Creator: McCurtain, Green (fl. 1903-1908) Place Written: s.l. Type: Printed document signed Date: 4 June 1907 Pagination: 2 p. ; 35.5 x 21.6 cm. Summary of Content: Serves as an official document issued 3 December 1904 providing for the allotment of land to freedmen within the Choctaw and Chickasaw Nations. This particular document allots 40 acres of land to Morris Clark. Partially printed; information pertaining to acreage and specific land allotment is typed in blue ink. 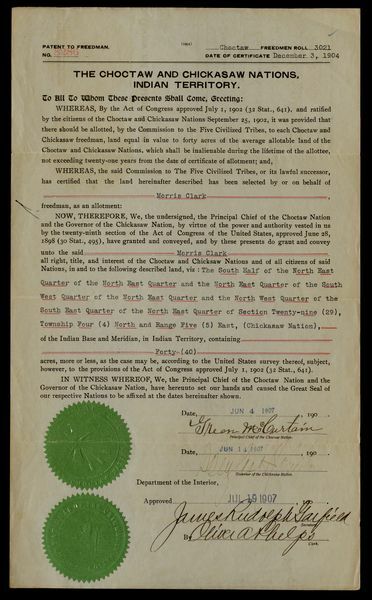 Signed by McCurtain as Principle Chief of the Choctaw Nation on 4 June 1907. Signed by Douglas Hancock Johnston as Governor of the Chickasaw Nation 14 June 1907. Signed by Oliver A. Phelps, clerk for the Department of the Interior on behalf of James Rudolph Garfield, Secretary of the Interior. Signed on docket by J. G. Wright, Commissioner to Chickasaw and Choctaw Nations ("The Five Civilized Tribes") and William T. Martin, a clerk, 23 July 1907.